The buzz around town may be talk of a recession and the global economic crisis, but none of it fazes businessman Humphrey Tan Koon Yee. While others are postponing and pulling back on big projects and investments, the 57-year-old Tan is embarking on his life-long dream - and the biggest project he has yet to achieve - an ambitious RM330 million shopping centre in the heart of the Kota Kinabalu central business district. The industrial engineer by training, who is now managing director of Makamewah Sdn Bhd, got an early insight into the business world, thanks to his father, who was one of Sabah's pioneer timber tycoons. With his knowledge and values passed on from his father, he began his first foray into the business world with a small-time "Shop and Save" supermarket in his hometown of Sandakan in 1982, when neighbourhood sundry stores were the order of the day. Since then he has ventured into the property business, opening up another "Shop and Save", a fashion outlet, a hotel, a hypermarket which was bought over by Giant, as well as the construction of Wisma Bandaraya, and a few oil palm plantations. "Against this background, I had a dream to marry my years of experience in retailing, property development and financing to create the finest shopping complex in Sabah," Tan said. He said that his confidence came from doing his analysis and knowing he had the best site in the city and the best team of consultants, anchor tenants and configuration for a shopping complex. 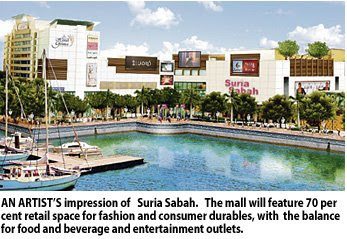 The shopping complex, Suria Sabah, is 700,000 sq ft of purely retail space for 250 outlets, in the centre of Kota Kinabalu's central business district and by the waterfront. The mall will feature 70 per cent retail space for fashion and consumer durables, while the balance is for food and beverage and entertainment outlets. A four-star hotel with 80 per cent of sea-view rooms is also in the planning. The eight-level shopping centre also has Metrojaya Department Store and Golden Screen Cinemas as its anchor tenants, who officially sealed the deal in a handover ceremony on Tuesday, which was witnessed by mayor Datuk Iliyas Ibrahim. The mall was designed as a single lane mall, and 85 per cent ownership to be retained by the developer for maximum tenant control. Tan said that so far, 30 per cent of its lots have been occupied, with many more waiting for confirmation. The mall is expected to be completed by July, and operational by October this year. Mah Sing is offering homes at Aman Perdana at affordable prices. While developers are offering a plethora of innovative packages for home ownership, buyers need to carefully consider their financial standing before signing on the dotted line. AS we enter the middle of the year, more developers appear to be offering easy home ownership campaigns. While some have started as early as last year, others are working with their banking partners to offer these schemes this year and are now rolling out their “goodies”. Going forward, there may be more of such schemes entering the market. 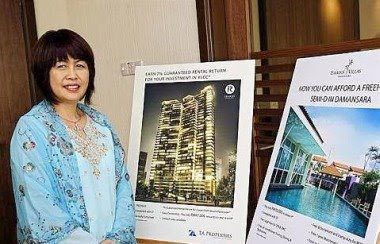 Datin Alicia Tiah with promotional materials for Idaman Residence, which is in the KLCC vicinity, and Idaman Villas, in Petaling Jaya. Be it old stock or new launches, developers essentially have to sell to generate revenue. If they own the land they are building on, and it is loan free, they are in a better position. If the land comes with a loan, it has a holding cost. If a developer is targeting local buyers, he will be in a better position than the one building for foreigners. If it is a landed project, it will be in a better position than say, a condominium development. So there are different scenarios and the list goes on. Now, let’s take a look at the banks. Whether banks enter into these various easy payment schemes with developers depends on several factors. Essentially, what is the credit standing of the developer? Where and what is the project about? Is it residential or commercial, high-rise or landed? The residential segment of the property market remains the most dominant in 2008, accounting for 64% of the total volume and 47% of the total value of transactions. The local property market recorded 340,240 transactions valued at RM88.34bil last year. Even if a developer has good financial standing, and the project is a winner, the next question to be asked is the credit worthiness of the buyer. Before signing on the dotted line, a buyer must bear in mind that a property is a long-term commitment. While it is true that there are savings to be made if one were to buy today – what with the free legal loan documentation and stamp duty and other freebies – one must think carefully of one’s financial standing and cash flow. Developers in today’s market scenario will dish out innovative packages because they want to sell. It is up to the buyer to think carefully of his/her financial standing and if he/she prefers to use the resources for something else. She adds that TA’s easy payment scheme for its semi-detached, bungalows and condominium developments in KLCC is not necessarily meant for just about anyone. “Yes, we want to sell, but not just to anyone. The banks too, will have to see if buyers have the capabilities. It does not mean that with the easy payment scheme, everybody can buy something. The acid test is there,” she says. Developers like TA, Glomac Bhd, IJM Land Bhd and Mah Sing Bhd have entered into such arrangements to boost sales. For its bungalow project Damansara Idaman, also in Petaling Jaya, buyers can save more than RM200,000 for the remaining five bungalows under the third phase. Buyers are required to fork out RM30,000 for the semi-detached units and RM50,000 for bungalows as an initial payment. The fourth phase of Damansara Idaman, comprising 27 bungalow units, is yet to be launched but will not come under the scheme. It also has a third package for its Idaman Residence condominium in the KLCC vicinity. TA is offering a 7% guaranteed rental return for that project which is currently 95% sold. There are 20 units left including seven penthouses. The scheme involves a downpayment of about RM50,000 to gain possession of a unit which is then leased back to developer for two years. The 7% may be used to offset the initial 10% of the cost of the RM2mil condominium. IJM Land is offering homebuyers a 95% loan under its My Space Plan, which runs from April to June 30. The plan includes no interest payment during construction period, free legal fees on the sale and purchase agreement, free legal fees on loan, and free stamp duty upon transfer. Its corporate communication manager Juliet Choong says the plan covers residential projects ranging from landed properties to high end condominiums in all regions from Penang, the Klang Valley, Seremban and Johor to Sandakan and Kuching in East Malaysia. “We are targeting sales of RM250mil from this home ownership plan,” she says. IJM Land plans to launch about 10 projects with properties worth around RM700mil throughout the country. It is particularly excited about the initial phase of one of their most exciting projects in Penang: The Light Linear and The Light Point. Also in the pipeline is Nusa Duta, a landed-mixed development project in Taman Perling, Johor Baru. Over at Mah Sing, the developer is offering several packages depending on whether it is completed or otherwise. Essentially, the buyer pays 5% and the rest is a loan. Glomac meanwhile is offering a 100% loan package with the usual freebies of free legal fees for signing of the sale and purchase agreement and loan documentation for three of its township developments – Bandar Saujana Utama in Sungai Buloh, Saujana Rawang in Rawang and Sri Saujana in Johor. The package is limited to residential units only. Buyers of its commercial projects have the possibility of 90% loans. Group MD Datuk Fateh Iskandar Mohamed Mansor says if a buyer is not entitled to the 100% loan, the difference between the purchase price and the loan amount (which is called the differential sum) can be paid through an easy payment, interest free for 10 months. The company is also offering a RM500 cash reward for existing buyers if they introduce referrals for properties in the three townships. In addition, it is also giving away a free TV for all township buyers for residential units only. Although there is currently a plethora of goodies being offered, there is a cost to it. If a developer is offering a package which offers a RM1,000 booking fee and a monthly repayment of RM1,300 for the next five years for a semi-detached unit, the buyer is essentially paying interest for the next five years. It is only on the sixth year that capital repayment kicks in and when this happens, the monthly repayment will swell to about RM2,000. So the little push is coming from both banks and developers, but hey the money is in your pocket. High time to refinance your loan? With lending rates at historical low levels, the obvious question to ask is – should one refinance their home loans? The answer is simple – if there are net savings to be enjoyed by refinancing the existing loan, then yes. If the impact is neutral, then there’s little point going through all that hassle. 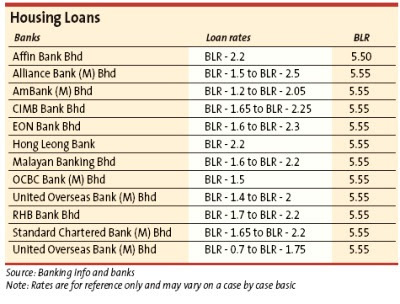 Two years ago, banks were charging home buyers base lending rate (BLR) “plus” interest rates for their housing loans. Today, the BLR for mortgages has fallen to a “minus” level. In addition, then, the average BLR was about 6.75% which was later adjusted to about 5.55% currently. The fall in lending rates followed the unprecedented cut in overnight policy rate (OPR) by Bank Negara Malaysia since November last year by 150 basis points to 2% as it stands now. Over the week, the central bank paused on its rate cut, leaving the OPR unchanged. This has led some economists to predict that there will be no more OPR cuts for the rest of 2009 and 2010 which may give borrowers a reason to lock in their interest rates for housing loans at current low levels. If the economy stabilises by next year, analysts expect interest rates to rise. But the views are mixed as there are also analysts who feel that if the situation worsens, Bank Negara could further cut the OPR. Dr Choong Kwai Fatt, tax consultant and associate professor at the Faculty of Business and Accountancy, Universiti Malaya, opines that now may be a good time to refinance home loans. “For refinancing, we recommend customers to change to Flexi loan, which allows them to make additional repayment and draw balance at any time with convenience of automated teller machine cards and cheque books. In addition, any amount in the current account is used to reduce the outstanding loan amount, hence there are interest savings,” he says. AmResearch deputy head of research Fiona Leong concurs. She says banks are proactively trying to retain their customers from changing to other banks during this period as they scout for better packages. “Customer retention is the name of the game for mortgage loan,” she says, quoting Hong Leong Bank Bhd’s statement. In view of economic uncertainty, Leong says most economists expect some downward revision in BLR but none expect them to be sustantial. Home owner Ang, 42, is planning to refinance his outstanding loan of RM153,000 given the prevailing low interest rates. He’s not sure whether to do so with his existing bank or switch to another but it all depends on which one will offer more savings. He took a RM200,000 10-year loan with current BLR plus 0.25% from a local bank three years ago and he has seven years remaining to service his outstanding loan. By refinancing with his existing bank, he will be able to avoid the penalty fees of RM4,590 (imposed on those who switch banks) but the lending rate may be higher than what other banks could offer him for the rest of the loan tenure. If he were to refinance, Ang says his monthly instalment will reduce to RM2,120 from RM2,240 per month. Another option is for him to maintain the monthly instalment but reduce his loan tenure. Hoping to take advantage of the situation by wooing customers, some banks such as EON Bank is offering packages that partially absorbs customers’ early settlement and legal fees but with slightly higher interest rates. Public Bank Bhd is offering BLR minus 1.8% to 2.0% but the bank will not absorb penalty charges incurred by customers for switching bank during the lock in period. Typically, banks’ lock in period is about five years; customers who switch banks before this period ends will have to fork out a penalty fee which comprises 3% of total loan amount or loan outstanding or a minimum penalty of RM5,000-RM10,000. The fees however vary from bank to bank. There are other costs involved in switching lenders as well such as search fees, inspection fees, stamp duty and loan legal fees (usually costs less than 3% of total loan). It is important to note that all rates and terms and conditions are negotiable, and hence, vary on a case by case basis. The price outlook for Malaysian timber products remains flattish or negative, with an expected pick-up in plywood demand from Japan the only bright spot going forward, according to industry players. Housing demand in Japan is expected to recover in September as a stimulus package for house buyers there starts to kick in, says Datuk Wong Kuo Hea, managing director of timber and plantation group Ta Ann Holdings Bhd. Recently, plywood makers from three countries – Indonesia, Malaysia and Japan – had a meeting and agreed to try to sustain their prices. 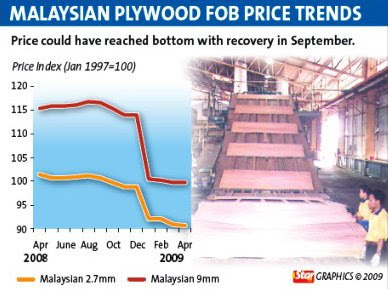 “So plywood price has reached a bottom, (but) unfortunately consumption is going down for the next six months. Therefore, the price should be flat,” Wong says. However, the demand for logs is still strong, particularly from India, but not from China where it is flat, he adds. The International Timber Trade Organisation (ITTO), in its latest market report, says prices of Malaysian timber products “are not expected to hold,” due to the weakening domestic residential and commercial property industry. The trade organisation notes that foreclosures of both private and commercial properties are on the rise in the wake of massive layoffs by major multinational companies and a slump in domestic demand. “At the forefront of the layoffs were suppliers of major building and construction materials and household accessories. “Prices of residential properties, often propped up by foreign investors and speculators, may actually decline for the first time,” it says. However, ITTO sees a bottoming out of prices this month in Japan, a key importing market for Malaysian timber products. Prices of timber products in Japan are expected to bottom out after the Japanese Golden Week holidays in early May, it says. On the global front, data show weakening timber-related exports. Ghana reported dips in all timber product exports, except plywood, in 2008 while Brazil’s furniture exports to Argentina dropped 51% in the first two months of 2009. Peru’s wood product exports also fell nearly 50% in the first two months of this year compared with the same period in 2008. European imports last year showed a marked decline for tropical hardwood products, while China was the only country posting mixed results. China’s export value of wood and non-wood furniture grew 21.5% in 2008 but wood flooring sales declined in the fourth quarter of the same year. ASIANS’ lower risk appetite has been a blessing as it has spared the region a more severe impact from the global financial meltdown. The people’s prudence and higher propensity to save have provided a much needed cushion to help them sail through the current tumultuous times. We should be thankful for still upholding these virtues like what our great grandparents used to do in the good old days. These virtues will hopefully be passed on to our children and grandchildren to appreciate the goodness of living within one’s means and saving for rainy days. It is heartening to note that Malaysians have yet again shown that they are a prudent lot and have pulled the brakes on unnecessary spending. This is seen in the high subscription for the various tranches of government bond issues to raise funds to finance projects and various allocations made under the two stimulus packages. The global economy is still not out of the woods yet and there will still be many difficult months ahead before things start to stabilise again. While the property “chase” in the United States has contributed to much of the over-lending activities and the sub-prime loans debacle that triggered the global financial meltdown last June, Malaysians have not succumbed to over-speculating in property and are not over-geared. By and large, Malaysians are relatively unscathed by the subprime mortgage and credit crunch crisis that emanated from the United States. 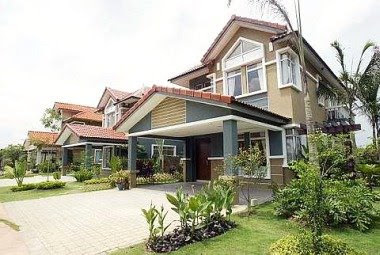 Developers have served many cash buyers for properties priced above RM1mil, which goes to show that many rich Malaysians prefer to be debt-free than pay exorbitantly for their property, as they believe that by the time their bank loans are settled, the full amount they have forked out would add up to almost double the property’s price. That was before Bank Negara slashed the overnight policy rate to an all-time low of 2% per annum in February and the subsequent drop in housing mortgage rates to as low as base lending rate minus 2.3% now. With rates having came down to the current lows, does it mean that the market is ready to see a huge influx in property take-up and more people will be rushing to invest in property? There are various schools of thought on the subject. Some, including developers, say this is the best chance for buyers to shop for their dream house as lending rates and property prices will not continue to stay at the current low but will start rising by the middle of next year. By leveraging on the low mortgage rates and lock in at this level for their whole loan tenure, borrowers will be able to enjoy the prevailing low rates and save substantially on interests. After all, property is a tangible asset and one of the best instruments to hedge against inflation when things start to get expensive again with an economic recovery. However, there are others who believe that however low the cost of transaction may go down, it all boils down to the people’s confidence in the economy and their job security. They will not commit to a new property just yet until there are more convincing economic data to show a bottoming out of the global economic downturn. Nevertheless, the latest March loan approval figures unveiled by Bank Negara of a 49.1% and 31.1% month-on-month increase in residential and non-residential property loan approvals show property buying activities are making a comeback. The latest statistics also show that for the very first time in six months, residential property loan approvals have risen by 10.7% on year-on-year basis. The higher figures show that the aggressive sales promotions by developers since late January are having a positive impact on property sales and loan approvals. Besides better sales numbers in the first quarter of this year, the higher loan approvals may also be driven by re-financing of existing mortgages. Ultimately, the decision to buy or not depends on one’s financial capability and risk-propensity. · Deputy news editor Angie Ng hopes that Malaysia and most parts of Asia will be spared the threat of a swine flu pandemic that is currently ravaging other parts of the world. JOHOR BARU: House buyers in Johor should not be unduly worried that housing projects in the state will be abandoned during the current economic downturn. In the last 10 years, the state had seen only 2% of projects abandoned, said Real Estate and Housing Developers Association (Rehda) Johor branch chairman Lee Kim Chai. He said most of the residential and commercial properties were close to completion and those completed were already issued with certificates of fitness. “House buyers are becoming more knowledgeable and discerning and they will shop around before making their purchase,” Lee told StarBiz at the launch of the Malaysia Property Expo 2009 recently. The four-day event saw 31 developers offering 8,000 units of mixed properties valued at more than RM2.7bil. Lee expected most developers would not launch new products under the economic conditions now but would focus on selling off their completed units. “Developers are also working closely with banks to offer different financial packages to attract buyers including low interest rates on approved loans,” he said. Lee said given the abundance of real estate available, the Johor property scene would be market-driven with prices becoming more competitive. Meanwhile, Asiatic Land Development Sdn Bhd vice president Habibullah Khong Sow Kee said the take-up rate for its two projects in Johor was encouraging during this downturn. The projects are the Asiatic Indahpura township in Kulai covering an area of 2,832.79ha and Pura Kenchana township in Batu Pahat on a 3,642.17ha site. He said 404.65ha had been developed in the Kulai project to date with 5,000 units of residential and commercial mixed properties and 129.49ha in Batu Pahat with 2,000 units of mixed properties. “Demand for property in secondary towns such as Batu Pahat is good as people there are going for lifestyle living instead of just buying homes,” said Habibullah. Asiatic Land is a wholly-owned subsidiary of Asiatic Development Bhd and a member of the Genting Group. EON Bank Bhd saw the number of housing loans almost doubling in the first quarter of 2009 from a year earlier, thanks to its Super Easi 123 Home Loan campaign launched last year. The lender recorded a total mortgage loan acceptance of RM300 million for the first three months of the year, compared with RM190 million a year ago. The Super Easi Home Loan campaign, which features a financing base lending rate of -2.2 per cent coupled with a 48 hours turnaround promise, managed to achieve RM1.025 billion in total sales in 2008. "We still maintain our target of between 6 per cent and 8 per cent total loan growth for the year. The trend for the last three months has seen that the consumer segment has a better opportunity for growth. 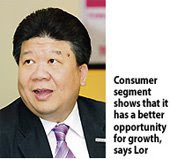 Having said that though, business loans are stable," EON Bank head of group consumer banking Michael Lor Chee Leng told reporters in Kuala Lumpur yesterday. For the first-quarter, total loan disbursement grew by about 50 per cent to RM2 billion. Of this, RM1.1 billion was from individual sectors of consumer loans such as higher purchase and home loans, while some RM900 million was disbursed to businesses. EON Bank yesterday announced a three-month campaign, which offers customers who apply for a new home loan for both refinancing and purchases of completed properties a new Toshiba Natural Picture LCD television (TV). The bank expects to lend out another RM400 million during the campaign. The latest mortgage campaign is applicable to new home loan applications with a minimum amount of RM200,000 approved during the campaign period and accepted within 48 hours. For approved loan amounts of RM200,000 to RM399,999, RM400,000 to RM999,999 or RM1 million and above, customers will automatically qualify for a 26", 32" or 42" Toshiba Natural Picture LCD TV respectively. Toshiba Sales Services Sdn Bhd director Shunji Kamimura said the company is confident that it will be able to grow revenue to RM650 million for the current financial year, up from RM600 million registered in the last financial year ending April 30 2009. Growth is expected to slow down to 10 per cent this year, as compared with the last three years which saw an average growth rate of 30 per cent. "Even though growth is slowing we will not slow down on advertising and promotion spending. This year we have allocated RM30 million for activities such as this campaign," Shunji said.